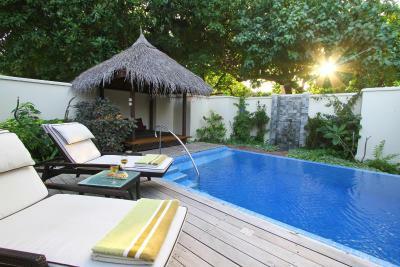 Lock in a great price for Kurumba Maldives – rated 9 by recent guests! 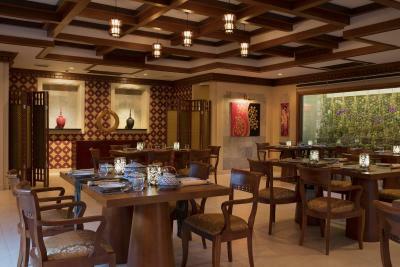 excellent location, and dining options, super friendly staff. good beaches and amazing marine life! excellent location and reasonable breakfast. staff needs to have continuous training sessions on hospitality. 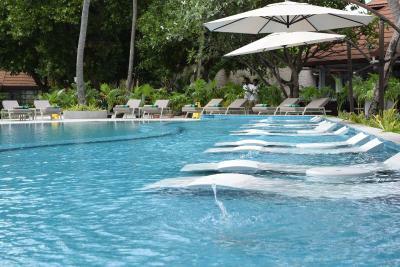 The staff is nice and welcome, espeically the free snorkelling course, hotel takes care of guests safety, very good!! I enjoyed the snorkelling very much! Food was great. 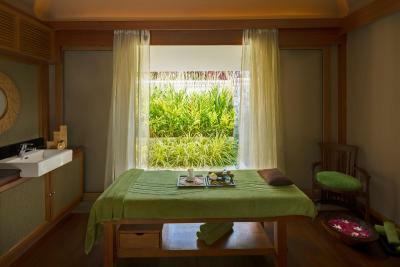 Staff was extremely friendly and attentive. Ilona served the best drinks at the beach bar. Very peaceful island. The snorkeling on the house reef was absolutely amazing! I saw sharks, sea turtles, an octopus and countless other fish I've never seen on all my snorkel trips in the Caribbean. Amazing resort - exceeded our expectations. The accommodation was wonderful and very comfortable. The staff were all extremely friendly and helpful. Shout out to Chef Nanda Kumar at Kurumba - he took special care and went the extra mile to make sure we enjoyed our experiences at the resort restaurants. The beaches were clean, and sparkling! You get a nice view of Male city as well since the resort is only 10 minutes away by speed boat from Male. 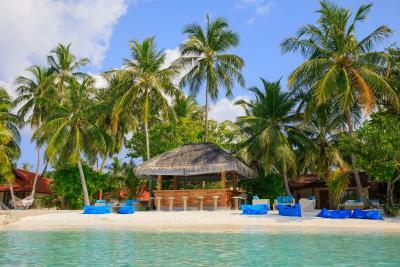 Would highly recommend a stay here if you're visiting Maldives - this resort is great! Great place, very close to Male very convenient to go from the airport. The beaches around the property are great for snorkeling, you can see a lot of fishes right there. Finally the staff is amazing, all of them but special Kudos for Lahfan and the team from the Cafe restaurant. Variety of the food in Buffet restaurant was excellent and the staffs are very well educated. 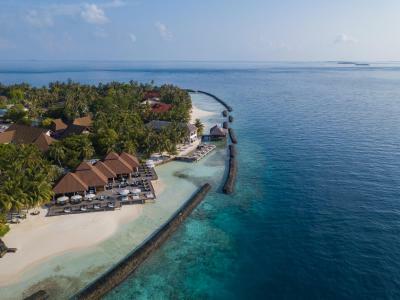 Kurumba Maldives This rating is a reflection of how the property compares to the industry standard when it comes to price, facilities and services available. It's based on a self-evaluation by the property. Use this rating to help choose your stay! One of our best sellers in North Male Atoll! 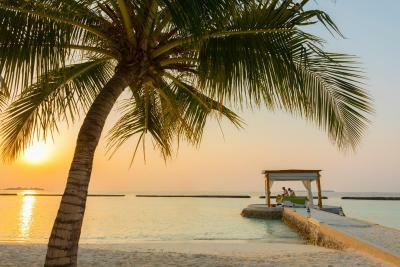 On a tropical private island in North Male Atoll, Kurumba Maldives features beautiful white sand beaches and scenic coconut trees. 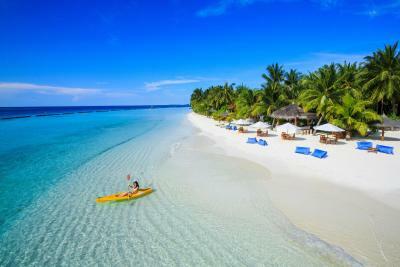 It is just 10 minutes by speedboat from the airport with boat transfers available 24 hours a day. 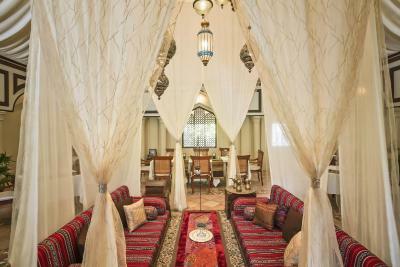 It offers free WiFi in all rooms, 8 restaurants and 4 bars. 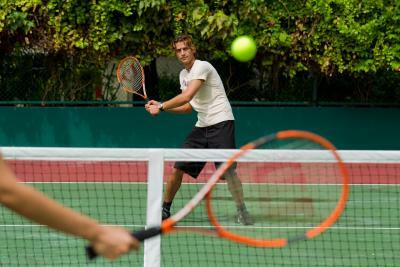 The resort has 2 outdoor freshwater pools, 3 tennis courts and a fitness center. 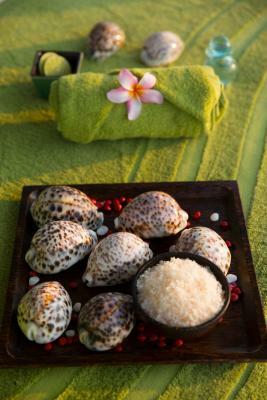 Offering a wide range of treatments, Veli Spa proposes the unique Dhivehi Beys treatments, as well as both modern and traditional treatments. Island-hopping tours and fishing trips are available, as well as customized excursions. 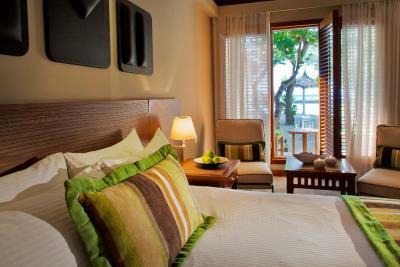 The luxurious rooms and villas feature private terraces with beach views. Each room has a cable/satellite TV, Chinese cable channels, a safe and a work desk. 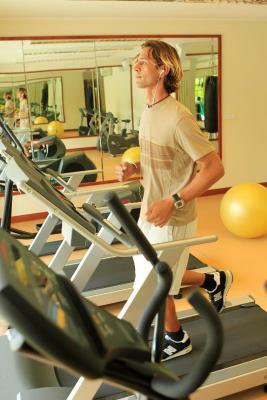 A fridge and tea/coffee-making facilities are also provided. Private bathrooms come with a bathtub and shower. Extras include a beach bag, slippers and an electric kettle. 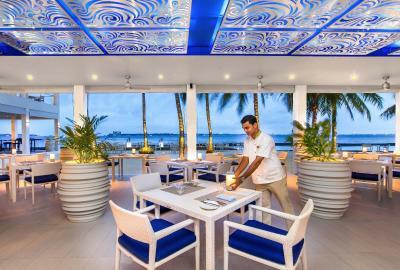 Kurumba’s restaurants boast an impressive variety of cuisines, including Italian, Japanese, Indian, and Lebanese choices. 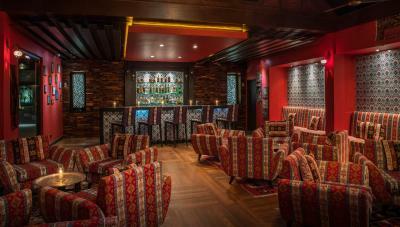 Fez lounge features a wide selection of shisha, cocktails and snacks, Athiri bar is the best spot for gorgeous sunset views and Kandu bar offers live music. 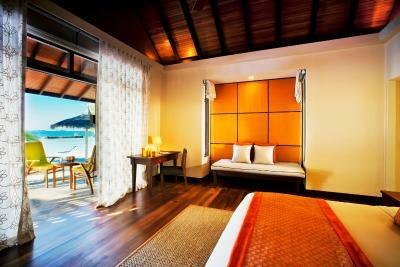 When would you like to stay at Kurumba Maldives? 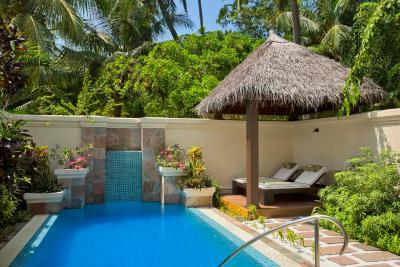 Deluxe Bungalows are nestled among tropical gardens. These are within a short stroll from the beach with ocean views. 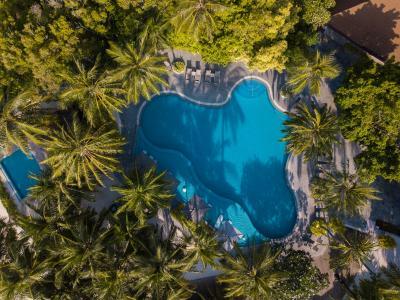 They are equipped with an outdoor veranda and day bed, a spacious high-ceiling bedroom, a large open bathroom, indoor and outdoor shower and a free-standing bathtub. 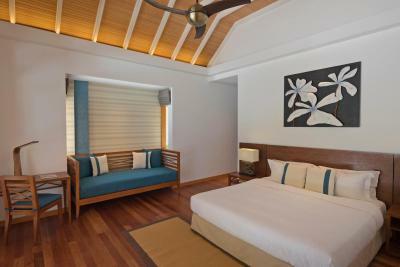 Bungalow comes with 1 king-sized bed or 2 single beds, subject to availability. Bedding type is subject to availability. It can accommodate 2 additional people. 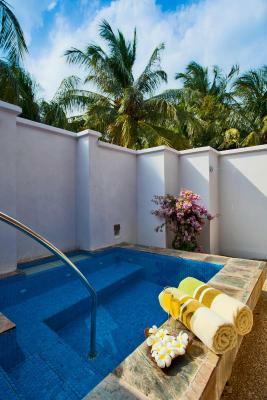 This air-conditioned room comes with downstairs veranda or upstairs private balcony. 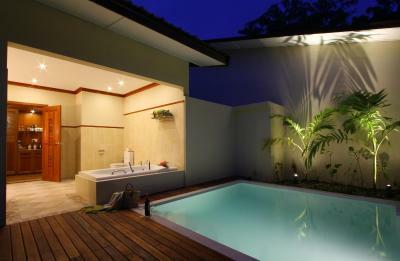 The bedroom leads to an open-plan bathroom, well-appointed with a garden, bathtub, outdoor and indoor shower. An additional bed or cot can be placed and offers interconnecting room options. It can accommodate an additional person. 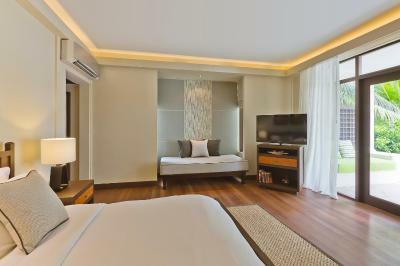 This room is located just steps away from the white sandy beaches and the blue ocean and offers view of the Male city in the distance. 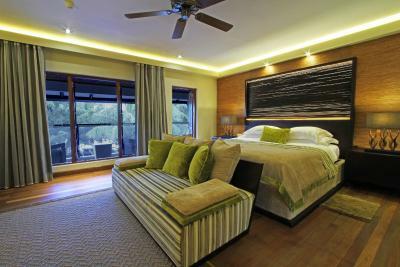 Spacious villas feature a large bedroom, sitting room and veranda that lead onto the white sands. 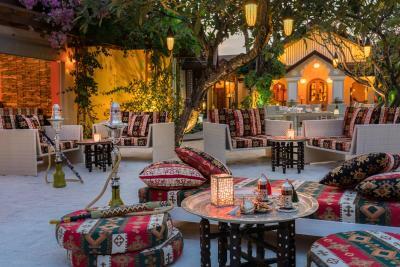 A private courtyard features a swimming pool/spa bath, set in a peaceful garden with a thatched roof daybed pavilion for relaxation and sun loungers. 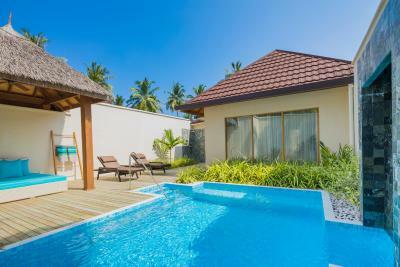 Pool villas enjoy the option of having premium breakfast in Thila and afternoon cocktails in Kandu Bar. It can accommodate 3 additional people. 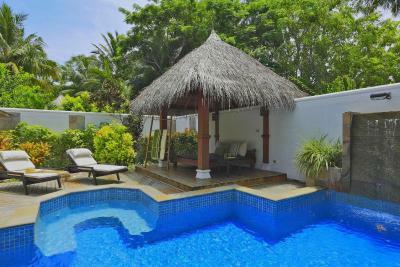 This bungalow is located just steps away from the white sandy beach, offering panoramic ocean views. 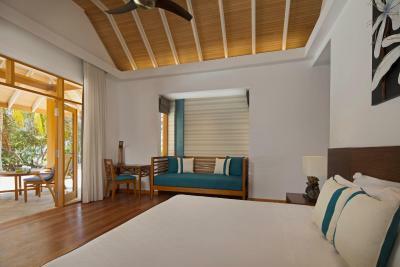 It is equipped with an outdoor veranda and day bed, a spacious high-ceiling bedroom, a large open bathroom, indoor and outdoor shower and a free-standing bathtub. It can accommodate 2 additional people. 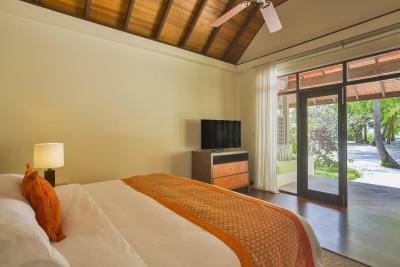 Nestled in verdant tropical gardens, this villa provides a bedroom and a sitting room separated by sliding doors. 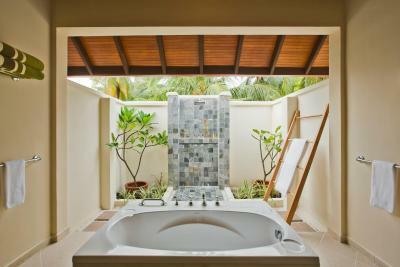 It has a large open bathroom with a separate bathtub and a private open courtyard complete with a rainshower and an outdoor plunge pool. Guests staying in the Garden Pool Villa enjoy the option of having Premium breakfast in Thila plus a range of thoughtful touches. 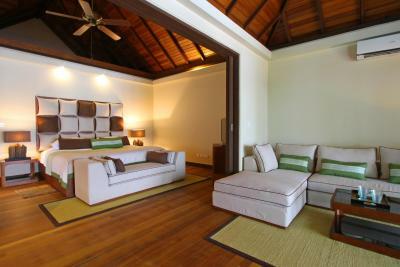 Spacious villa located on beachfront featuring a large bedroom, adjoining seating room and veranda. 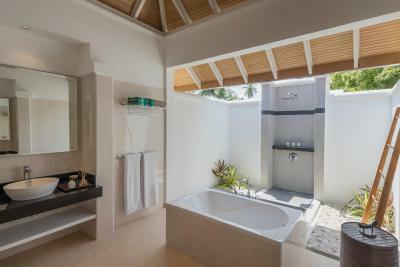 It comes with a spacious bathroom, indoor and outdoor shower, bathtub and open courtyard complete with a rainshower and an intimate outdoor garden spa bath. 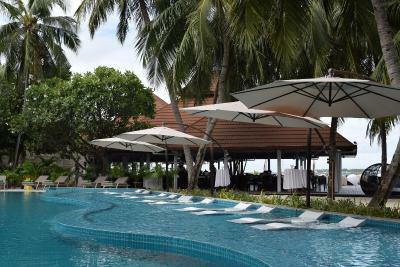 Guests staying in the Private Villa with Spa Bath enjoy the option of having premium breakfast in Thila and afternoon cocktails in Kandu Bar. An additional bed or cot can be placed and offers interconnecting room options. Selected rate with meals is total for 3 adults. 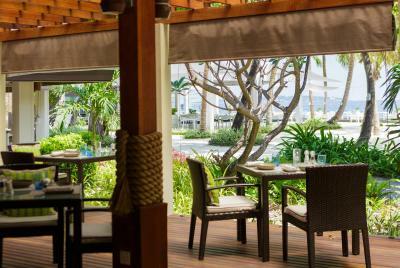 Selected rate with meals is total for 2 adults and 2 children below age 12. 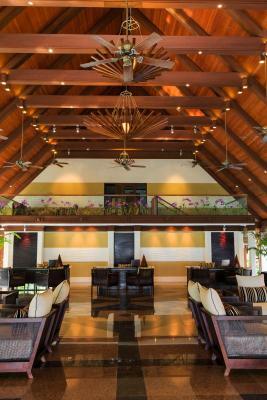 House Rules Kurumba Maldives takes special requests – add in the next step! All children under 12 years are charged USD 80 per night for extra beds. 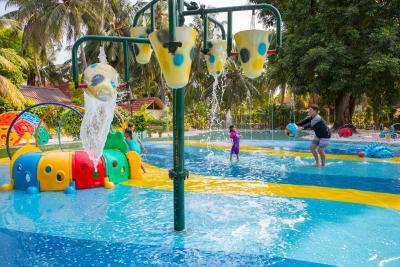 Any additional older children or adults are charged USD 92.40 per night for extra beds. 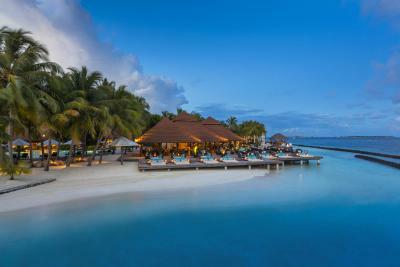 Kurumba Maldives accepts these cards and reserves the right to temporarily hold an amount prior to arrival. 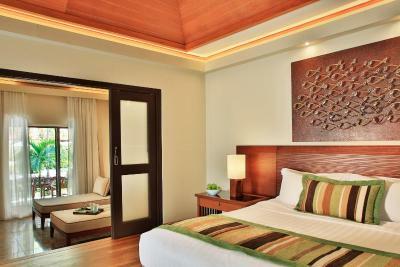 Guests must send arrival and departure flight details directly to the property at least 72 hours prior to arrival. 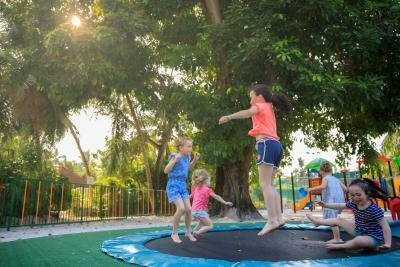 Children under 2 years will eat for free based on the rules and meal-plan accompanied by an adult, excluding alcoholic beverages. Please present the same credit card used to guarantee your booking when checking in / making the payment at the hotel. Please note that property may contact the cardholder for verification purposes. Third party payments are not accepted. Lunch & Dinner at the main restaurant with beverages. One candlelit dinner with a bottle of wine. The above offer is applicable for clients traveling within 6 months from the date of wedding and for stays minimum of 4 nights. A copy of the wedding certificate must be presented at the resort on request. dessert section at the Vihamanna need to kept more chilled , beacuse by the time you get to your table they all melted . its bot nice to eat runny and warm dessert . Beautiful resort by a short distance boat ride from the airport . Very friendly and helpful staff .Food at the Vihamanna was delicious , we had different theme every night . beach was exceptionally clean and clear with white sandy beach . Bed was exceptionally comfortable . Lovely Julie helped us check in early and she gave us a tour around . she even helped me holding my 16 month old as I rest . 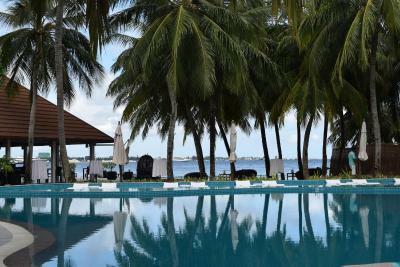 Especial thanks to Ram dai , Rupa , Shiva and all the staff at Kurumba for making us feel like home . They can mix up some extras on the room charges, nothing serious and easily cleared up. Overall a great resort, excellent food, very friendly staff, fast and comfortable airport transfer, amazing beach, great accommodation. Great place to relax! Special recommendation for the Diving center team, highly professional, dedicated and helpful! Staff, location, room sizes, food, friendliness. It was just full of good vibes. You walk down the roads and every staff passing by greets you with this friendly smile. Well trained ! The noise from the planes! The food the staff the ambiance the beaches & pools were all excellent. We did find it a bit noisy planes were going over every few minutes. View of airport, Male and the burning rubbish island in the distance, did let the resort down a liittle. Coral reef right outside our door. Sunset right outside our door. Attention to detail. We liked reef very much and location where the hotel is. Staff were very friendly especially buggy drivers. 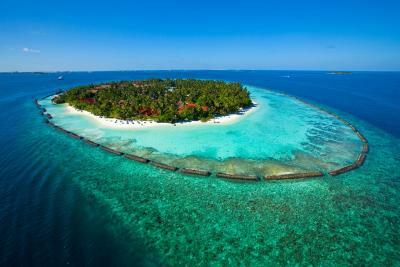 Kurumba is a beautiful resort in a breath taking location and it is made even better by the friendly staff who help any way they can. staff are programmed and can not think outside a certain parameter. Unfortunately the Dinner s 3 nights that we had at their Half board meal plan were not that tasty, The Cafe restaurant gave us a more tasty lunch twice that we had there. Break fast had a lot of options which was good. The Cafe restaurant gave us a more tasty lunch twice that we had there. The prawn preparation , Srilankan curry with rice were excellent preparations. Kundu bar has a lot to offer, Mocktails were very innovative. The bed was comfy. The openness to the beach was magnetic. View from the room was of lush green palm trees , wanting us to be outdoors . Round the island walk was hardly 30 minutes with lagoon water and sandy paths. We enjoyed it thoroughly.